Each year, the First United Methodist Church sets up a pumpkin patch on the church lawn. It's a popular photo stop and families are frequently seen posing for pictures. We took Dawson there his first year, missed the second year, and made it out again this year. I found his first pumpkin patch picture and it's amazing to see how much he's changed in 2 years. 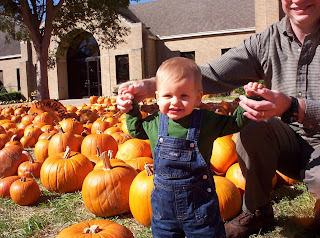 Dawson's first visit to the pumpkin patch when he was about 9 months old. 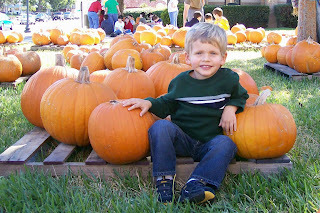 Dawson at the pumpkin patch again, 2 1/2 years old.